There’s no good design that isn’t accessible. In partnership with Dribbble, we’ve put together a series of Q&As with designers on the forefront of accessibility and inclusivity—this time, Gretchen Nash—for their thoughts, stories, and helpful hints. What made you realize accessible design is important? When did it click? It started early in my childhood, as I spent a lot of time with my grandmother who was blind. I watched her struggle to complete daily tasks in a world that does not often accommodate for that type of disability. Later in life, I found a passion for graphic design and realized that it is a powerful tool to translate complicated content into simple designs that enrich daily life. I really believe in inclusive design, so I was still not satisfied with flat graphic design being a barrier to the blind. About 5 years ago, when I started working on software experiences, screen reader technology opened my eyes to a whole new realm of important design considerations in my work. What’s the most heartwarming feedback you’ve gotten from this project? What makes you keep trekking on? 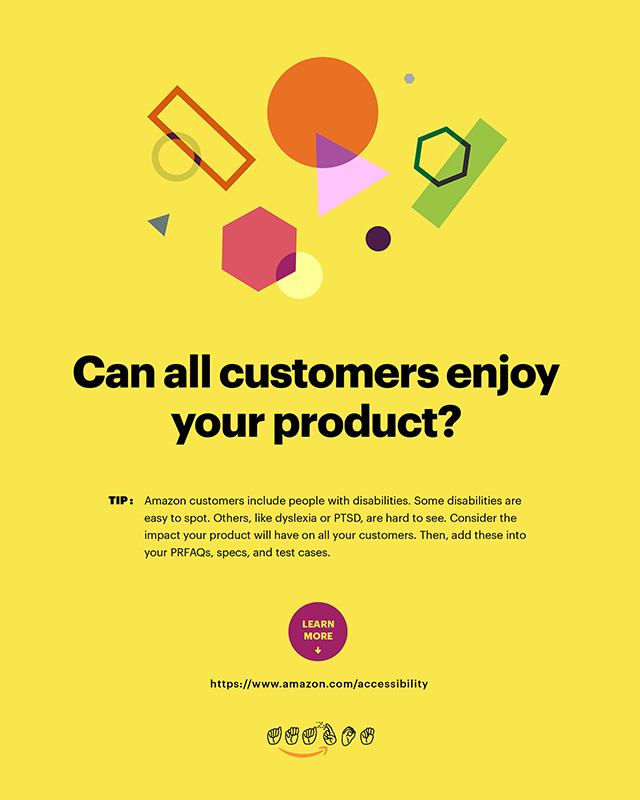 This project was meant to be an internal effort at Amazon to celebrate accessibility awareness month, but I have gotten lots of feedback to share this to a broader audience. I have had multiple people comment that before seeing these posters, they had never even considered accessibility in their designs. My hope is that when people see this series that they can carry these simple principles into their own work. Accessible design is an invisible superpower of any designer. I have heard a lot of designers grumble about how accessibility rules have a tendency to water down their designs, but I strive to challenge that notion. Inclusive design can still be beautiful while carrying the intended message—except it will resonate with a wider, more diverse audience. Showcasing work in a bubble is unfulfilling. What do you want the standard for accessible design to be in 2019? There have been incredible accessibility strides made by voice-enabled devices and software design in the past decade, which is awesome progress! However, it is often an afterthought. I see so many software experiences that slap on accessibility features (such as closed captioning, screen readers, settings, etc) at the very end of a design cycle. I would love for accessibility design to be included in the early stages of any design product, so that it actually does become a foundational standard in design. I work for a pretty traditional organization, and I’ve been struggling to explain the importance of accessible design. What are the magic words that will get my old-school team on board? Accessibility not only benefits those that struggle with disabilities but makes products overall easier to interact with and understand. The best designs are not just aesthetically pleasing, they are also easy to understand and functional. All of Gretchen’s posters hanging side-by-side at Amazon. 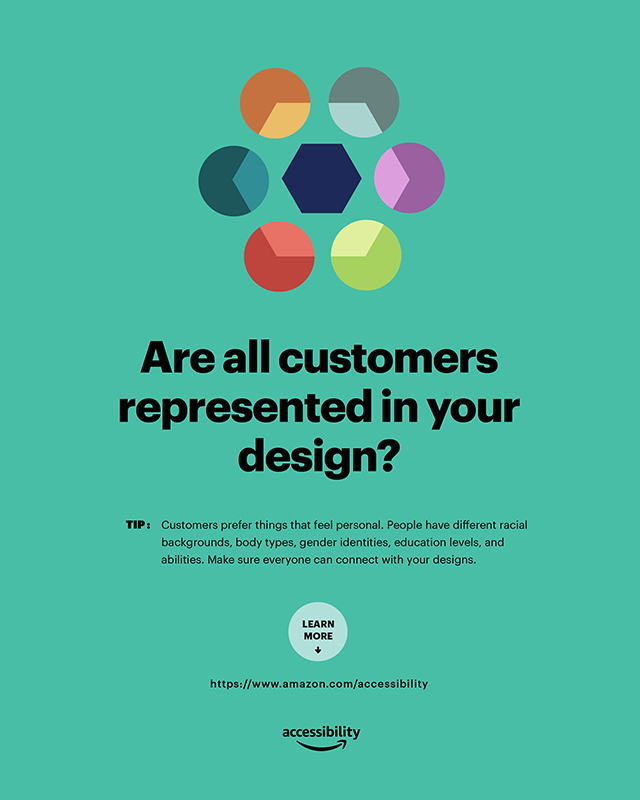 This poster series was created internally at Amazon to celebrate Accessibility Awareness Month during May 2018. 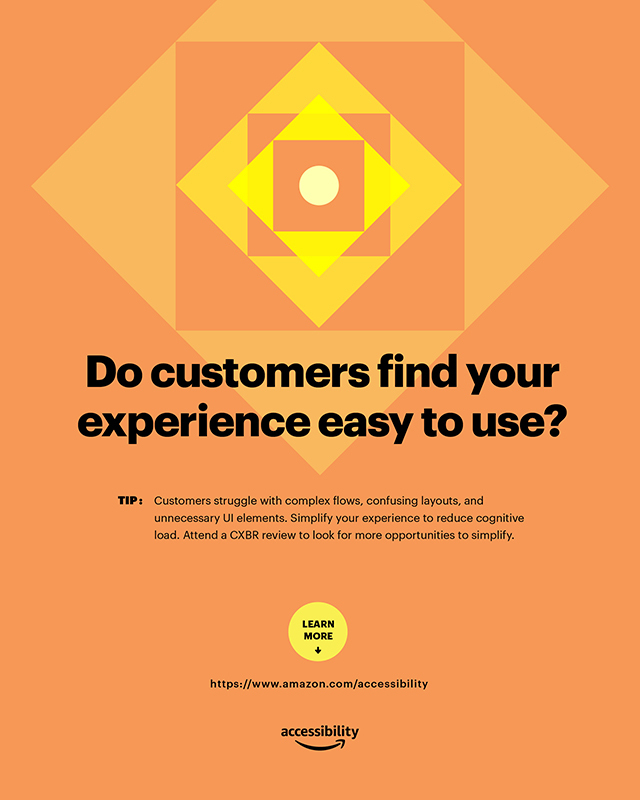 These posters were hung all around the Seattle campus to increase customer obsession through the lens of designing with accessibility and inclusivity in mind. The Accessibility team at Amazon provided the copy for the posters, and Gretchen created the layout and illustration style. Gretchen wanted to create a set of glyphs that were limited to basic geometric shapes and bright colors to keep the series simple and approachable. 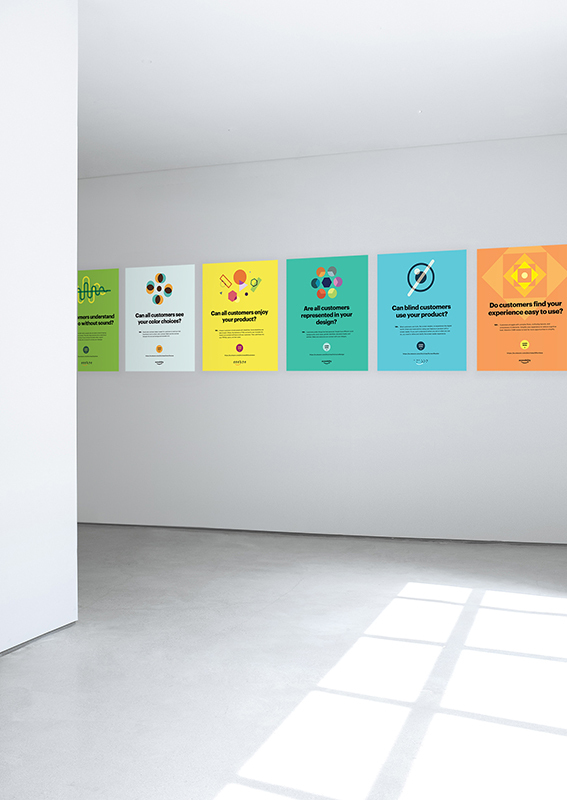 All of the copy in the posters is at a 3rd grade level or lower, and the layouts were optimized for ease of reading. For a deeper look into Gretchen’s work, check out her Dribbble account here. Gretchen is a multidisciplinary creative originally from Saginaw, MI. She currently resides in Seattle, WA with over a decade of professional experience in print, graphic design, motion, and software experience design. She currently works at the Amazon Device and Services Design Group as a Senior Visual UX Designer, where she focuses on multimodal device experiences within Alexa products. Outside of work, Gretchen likes to hang out with her cats, go to local concerts, and practice lettering.